Preserving heritage and tradition while opening cemeteries to various new technologies and tourists is a constant struggle of management across European cemeteries. New technologies like Artificial Inteligence, 3D printing and Virtual Reality will influence cemeteries in the future. While using the tools may be easy, proper managing of cemeteries within this aspect requires more knowledge and understanding. To address these issues, European Cemeteries route has organized a symposium which took place in Ljubljana (Slovenia) on April 6 - 7. Over 40 participants from 13 countries joined and were welcomed by Association of Significant Cemeteries in Europe president, Mrs Lidija Pliberšek. Symposium lead participants through several topics. From broader understanding of Cultural routes of Europe through the ways in which digital technologies may change yet preserve the cemeteries as we know them. Participants enjoyed testing of Virtual Reality walk through famous Žale cemetery. A detailed overview and testing of ARTOUR platform was performed to research the heritage and engage with visitors. Participants worked together and created a small test project of researching Žale cemetery discovering 36 interesting points in a 2 hours guided tour. 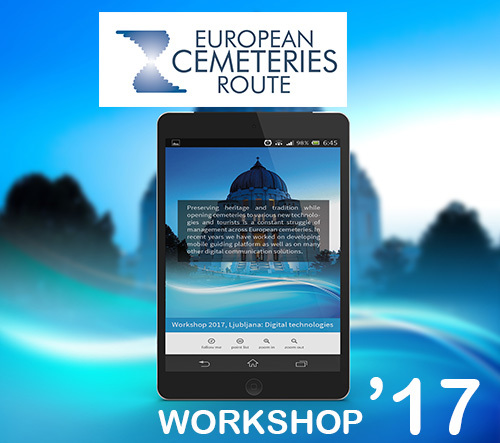 You can read more about the conclusions of this event that fascinated the participants at the European Cemeteries route event page.